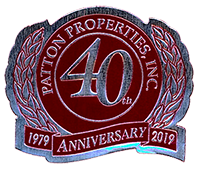 Testimonials - Patton Properties, Inc.
"I met Jim and became a client of Patton Properties in June of 2006. I have had nothing but great service from him and his staff; they are very professional, courteous and efficient. Having them manage my rental property couldn’t be any easier. I live out of state and feel that he is looking out for me as the client and helping me to make the best decision when it comes to my property. I would highly recommend them to anyone that needs a property manager." “What began with a listing of two rental properties with Patton Properties in 1993 has grown into a valued business relationship. Through the years more properties have been added with the confidence that my investments are in trust-worthy hands. So trusted, in fact, that my son now has three rental properties handled by Patton Properties. “Jim Patton has handled the rentals of several rental properties for me since 1990. “As a property owner I could not be happier. Communication is excellent and they are quick to resolve any issues. I was very pleased to find that they do not mess around with late payments or any other tenant issues. They move quickly to ensure payment, or start more aggressive process such as eviction.